transcosmos inc. (Headquarters: Tokyo, Japan; President and COO: Masataka Okuda) offered “DEC Connect,” its proprietary API integration platform, to the official LINE account of “Domohorn Wrinkle” operated by Saishunkan Pharmaceutical Co., Ltd. (Headquarters: Kumamoto Prefecture, Japan; President: Masaaki Nishikawa; Saishunkan). 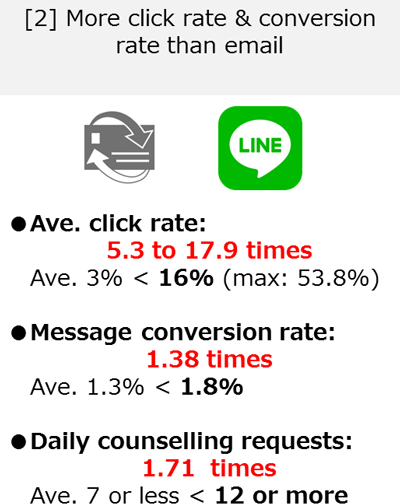 About 6 months after the launch of “Skin Care Counselling Services by LINE” in February 2018, the new services achieved significant performances. 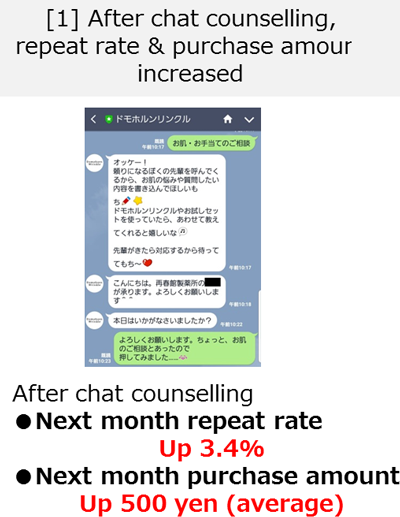 Compared to pre-launch, the ratio of repeat customers – customers who came back in the following month – increased 3.4%, purchase unit price went up 500 yen in average in the following month, and click rate increased up to 17.9 times higher than that of email. Recognizing the recent shift in customers’ purchase channels from traditional calls to the internet, Saishunkan decided to further utilize LINE and launched customer support services on LINE with the aim to have two-way communication with customers whilst maintaining high service quality in the digital channel. 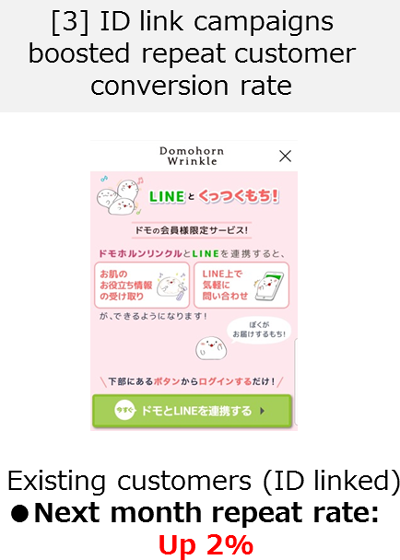 In addition to opening a instant counseling chat service (open from 9:00 a.m. to 6:00 p.m. from Monday to Friday excluding holidays), Saishunkan delivers messages, invite customers to their FAQ page, and offers an ID link function to their existing customers on the “Domohorn Wrinkle” LINE official account. As a result, Saishunkan saw an increase in most of their performance metrics that include repeat rate, purchase amount, total reach, and click rate. With the combination of email and LINE, total reach increased 145% with total reach by email service being 100%. In order to help Saishunkan implement the services, transcosmos created bot scenarios and built a system that enables chat agent services. “DEC Connect,” its proprietary API integration platform acts as a hub for the system and connects LINE Messaging API to “Reply ai,” a bot-building platform by Reply, Inc., transcosmos’s partner in the U.S., and “Oracle Service Cloud”, enabling the system to support Saishunkan’s customers on LINE. Based on the developed scenarios, “Omochi-chan,” Saishunkan’s LINE sticker character, welcomes customers as the first customer contact point and encourages customers to ask any question they have via a casual chat. “Omochi-chan” then escalates enquiries to Saishunkan’s chat agents so that they can solve customers’ concerns whilst building trust and nurturing a relationship with customers. transcosmos was the first to develop the LINE Business Connect-based platform which enables businesses to run one-to-one marketing and has an extensive record and experience in supporting businesses to leverage LINE. transcosmos is certified as a 2018 2nd half “Diamond” partner, the highest certification rank for “Sales Partner” in the “LINE Account Connect” category under the “LINE Biz-Solutions Partner Program,” a program by which LINE certifies its sales and development partners of various enterprise services offered by LINE. transcosmos is certified as the “Diamond” partner for the second straight year. With a team of 100 AI strategists with a wealth of experience, transcosmos has been offering bot-related services ranging from designing & building bots to tuning bot operations all in one stop. Building on the team’s knowledge and experience, transcosmos continues to help clients across a broad range of industries implement and operate LINE-related services. DEC Connect is a communication management platform which helps clients communicate with their customers by suitably combining various communication channels including LINE and Facebook Messenger with clients’ customer data, purchase data, website log, and other customer databases as well as with chat solutions like bot and AI. With this platform, clients can send messages to their customers and execute chat-based initiatives without any development. At the same time, its API based design helps clients drastically reduce man-hour to connect various communication channels as well as to set link to external databases and solutions.